Last autumn, we took our boys to the permanent funfair at Vystaviste Prague and were very lucky with the weather. Right at the entrance you might get hassled to try out the kids’ flying helicopters and train but don’t get fooled into thinking that this is all there is, as there is much more on offer further in. The organizers of the funfair (who are mainly gypsies or Roma) are very clever at selling rides on the dilapidated attractions right at the entrance to the fair. Playing along, we acted ‘dumb’ and let our boys go on one of these ‘first’ rides, knowing that much better stuff was yet to come. As for the ‘gypsies’, it is an old tradition that funfairs in Europe, especially in Slavic countries, are run by them. These people just love freedom and the mobile lifestyle. Some of them look rather rough, and I was happy to pay, although the rides were rather expensive. It cost 40 CZK per child, so if you have 2 kids, then it’s 80 CZK gone in a flash. They would probably laugh at me writing this, each of them having flashy Mercedes parked behind their trailors, using their rough looks to trick us and sell. And it worked…you have to admire their business acumen. For me as a parent, it was refreshing to see a stand with REAL ponies giving the boys a more realistic connection with the actual animals. I am not sure whether they appreciated them as much as I did, constantly turning their heads towards the “Go-carts” nearby. You have to walk down the stairs, in order to get to the heart of the gardens of the Expo Park and to reach the rest of the attractions. The tallest (and permanent one) is the big Ferris wheel, which did not have a name but the roller-coaster was called the CYCLON. The reason why I have waited a few years before taking the boys to a Matejska funfair, has been my concern about the high noise levels and over-stimulation. I don’t think it is the best for them psychologically. I do however believe, that the existing permanent display of attractions is just about enough for them to cope with at the moment and I will definitely take them to many more Matejska funfairs once they are older. Now for some history: Matějská funfair was named after St. Matthew, the patron saint of builders, butchers, confectioners, smiths and tailors. People also turned to him with prayers to cure their diseases. The funfair was originally held at St Matthew’s Church as an annual celebration of St Matthew’s Day, which is on 24th February. The origins of the funfair goes back some four hundred years to the Baroque period. At that time, the church stood in the middle of the woods, on an elevated piece of land sloping down to Šárka Valley. Merry-go-rounds and stalls with different commodities and sweets were gradually taking up more and more space, so in the end there was not enough room for the funfair around the church. As a result, the funfair moved to Dejvice. It was, however, also held near Letna, in Modřany or in Břevnov. In 1963, the funfair finally settled in Výstaviště Holešovice, which at that time was also known under the name of Park Oddechu a kultury Julia Fučíka (Julius Fučík Park). Výstaviště (showground) in Holešovice, has held host to this first spring funfair in Europe, for the last 45 years. Last year, the turnout at the funfair was around half a million visitors. This year the funfair is also expected to be very popular, as the weather forecast is very favourable. 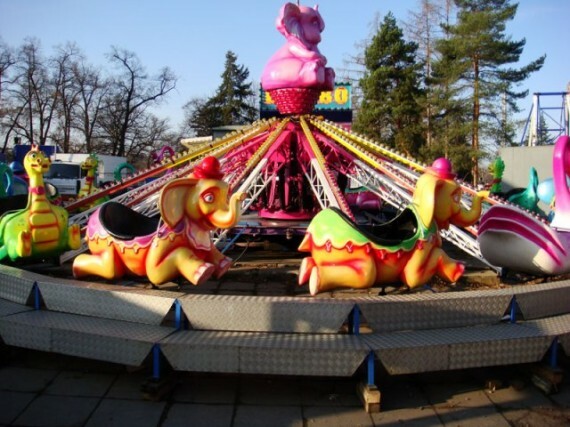 This year, the funfair will again comprise some Dutch attractions, the most interesting being an enormous chairoplane. An ordinary chairoplane is about eight or nine metres high, this Carousell is 50 metres. Have fun. However, there will be many more interesting attractions. The total number is 130 and they are designated for both little children, teenagers as well as for families. From mid-March, it will be also possible to visit Krizik Fountain, offering you an exceptional musical and dance experience. Křižík’s fountain is one of the biggest attractions of the Exhibition Grounds. It was built on the occasion of the centennial exhibition in 1891 and its current appearance is the result of reconstruction carried out a century later. Křižík’s fountain is without exaggeration unique in Europe. Its effects are produced by a number of water circuits, jets and underwater spotlights of various colors. These effects accompanying both classical and modern music are remembered as an outstanding experience by visitors from many countries. The walls of the adjacent pavilions encompassing the fountain create an amphitheatre for more than 6 000 spectators. Kids would love “The Little Mermaid” or ” Spirit of the Fountain” performances. Dont forget you can visit “The Sea World Aquarium” within the grounds, which Karen has already covered for you here.